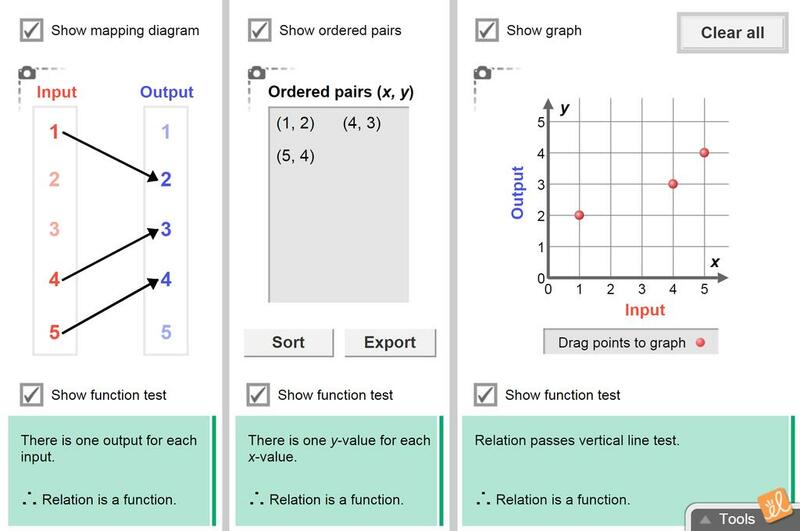 Determine if a relation is a function using the mapping diagram, ordered pairs, or the graph of the relation. Drag arrows from the domain to the range, type in ordered pairs, or drag points to the graph to add inputs and outputs to the relation. I created this worksheet for a group of students who are struggling readers and are below level in mathem... (more)atics. This worked well for them to start to grasp the concepts of relations and functions. This document defines basic relations and functions, and incorporates the gizmo to create models of relat... (more)ions and functions. Function testing is also presented. A small assessment follows the student handout. This original ExploreLearning Exploration Guide makes the lab more student-friendly by adding answer blan... (more)ks and graphics. This gizmo is a great way to highlight multiple representations and their connections. I've not been able to use this gizmo in a class yet, but I plan to do so soon. It will enhance student understanding.